Handcrafted Blue Ceramic Flying Pig from Thailand, "Flying Blue Pig"
Duangkamol affirms that pigs can fly with this charming figurine. Working in fine celadon ceramic, she crafts a blue pig with wings. 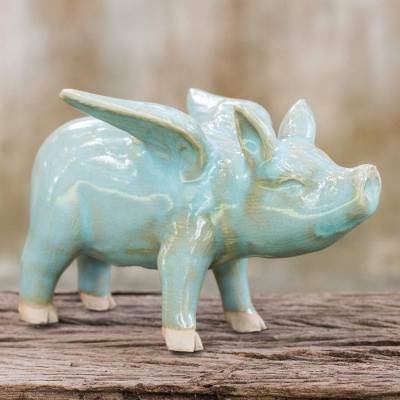 You can find celadon ceramic figurine 'Flying Blue Pig' by Duangkamol in sculpture categories such as Shabby Chic Sculpture and Ceramic Sculpture. Enjoy exploring these sections for other Novica treasures. Construction And Colors! Such Fantastic Decor! "Beautiful present for collection. Thanks"
For anyone that collects pig dÃ©cor...this is a must have. This beautiful pig has a front row seat on my book shelf. The wings have prompted me to seek out other flying animals from the Novica collection. I have traditionally not been a collector of figurines, but this little gentleman has changed that forever. His whimsical smile just lights up the room! "When pigs fly!" and now they do! This is so cute. Excellent presentation with perfect colors. Well done! My job is making pigs fly, this will be on my desk to remind me always! "Pigs do fly! This one is extra nice." Thank you Duangkamol! I gave this to my son as a Christmas gift.... I donated a Heifer International piglet (a real piglet) in his honor - then bought him this finely crafted pig for him to keep. He loved his flying pig! I bought this several years ago, so there may also be a testimonial. I got this as a gift for a brother who frequently uses the expression when pigs fly. Of course those dainty wings would never support that sturdy little piglet. The expression is both smug and mischievous. It takes an artist to convey so much personality with such simple shapes. As a ceramic collector I appreciate the artistry of the celadon glaze, and my brother liked the humor. ""When pigs fly" has always resonated with me." It took me 66 years to find the right pig, right color, right shape, right everything! I love my flying pig! Thank you!